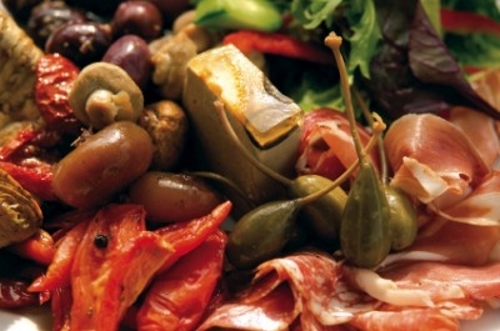 Roll the ham, prosciutto,capacolla and salami into toothpicks and arrange on a serving platter. Slice the mozzarella into 1/4 inch pieces and arrange. Slice the fontinella and asiago cheese into 1/2 inch pieces and arrange. Slice the red peppers,artichokes and pepperoncini and arrange. Place the olives on the plate.